Several years ago I was introduced to green smoothies. I thoroughly enjoy them! Especially in the hot summer months. What could be a more delicious healthy option than a creamy fruit smoothie with nutritious greens blended in? My favorite is almond or coconut milk with mixed frozen berries and a vanilla nutritional powder I found. The reason people juice is so they can get the most nutrition out of multiple fruit and vegetables in one drink without getting full, all while giving the digestive system a rest. It’s a great way to cleanse your body, to train your palette and to be energized. It’s also an outstanding way to lose weight, as a side benefit. Years ago I watched the movie “Fat, Sick and Nearly Dead”, which originally planted the thought in my mind – very subliminally. Last year I found out that we have a “Juice Bar” right in our little town. Twice during the summer I did a 3-day juice cleanse from them. I’ve also noticed the weight creeping up since I turned (ahem) the age I am… =) and I am pretty disgusted about it. In January 2017 I started a facebook group called New Dimensions where we are encouraging each other to lose weight, get fit, what-have-you and after 3 weeks, I decided I was going to do the research on juicing and what I found led me to decide to take the plunge! Since I am a researcher, I researched the different types of juicers. They have presses, masticating juicers and centrifugal juicers. Each has advantages and disadvantages and they range anywhere from $50 or so, to thousands of dollars. I talked to several of my friends and ended up purchasing the Omega 8006 Juicer. Here’s why. I plan to continue juicing for years and this one has a 15 year warranty. Most of the others were 1 year. It’s also a masticating juicer (sometimes referred to as a low speed juicer). The Omega 8006 processes at 80 rpm, whereas most other juicers process at a speed of 1,650 to 15,000 rpm. The low speed protects and maintains healthy enzymes, prevents oxidation and allows juice to be stored up to 72 hours without degradation. It is versatile enough to extract the maximum amount of juice from fruits, vegetables, leafy greens, even wheatgrass! (centrifugal juicers can not do greens and grass) And you can also use this to turn nuts into nut butters (an all-natural peanut butter), make baby food from natural, fresh ingredients, whip up soy milk, extrude pasta, grind coffee and spices, and mince herbs and garlic. I started juicing in early February and I LOVE it! After a couple of days just guessing with combinations, I decided to use Joe’s 30 day Classic Reboot (from Fat, Sick and Nearly Dead). The first 5 days are transitioning from food to juice so you don’t jolt your body. His recipes are delicious and so easy! If anyone would like to join us on our facebook group, we would love it! You can share your experiences, ask questions or just have a friendly group of people to help hold you accountable. Over the past few years I have been studying the power of sounds. This would include our words, the songs we listen to and even sounds we are unaware of. A better word would probably be vibrations or frequencies. You see everything gives off vibrations. Everything has a frequency. The reason I am thinking about this subject this morning is because I am sitting in my living room listening to so many amazing sounds. A chicken clucking, the goats bleating, a bird singing – all enjoying the gorgeous sunshiny day. The temperature is perfect, no wind and just overall lovely. I posted here about how this even includes the fabrics we wear and use in our daily surroundings. Words are not just something that we say, they have POWER. They create vibrations. They can literally destroy. This is scientific. There have been experiments done on drops of water where people have spoken to them and watched them under a microscope. Just using different words changed the shape of the water. What do you think your words do to you and to others? For those of you who are passionate about essential oils, like I am, I wanted to make you aware of a few of my recent exciting discoveries! For several years I was part of one of the large companies that distributes these oils and definitely saw people benefiting from the oils… but I have since found out a few things that concern me… and they should concern you too. Take a look at this article. Also, a lot of Direct Sales companies will jack up the prices of essential oils in order to pay their distributors, which means higher cost for us, the buyers. So what’s a person to do? How do we know which oils? Which companies can we trust? I know there are sources out there. I personally have found one with very reasonable prices that I am completely confident in, and I know there are others. My recommendation would be to do your research. Research the company. Do your own independent study if you can. Compare the results. ASK ME about the company I buy from! Read generic books and studies about essential oil quality – not those written by the companies that produce them… for an unbiased opinion. This book was highly recommended to me and I will be ordering it today. I have other books written by folks in the top two companies, but I wanted something that wasn’t written by one of their representatives. I’m excited to let you know what I think after I receive it on Monday! *Disclaimer: Amazon pays me a tiny commission for referring customers to them. This is one of the ways we can earn a small income through our blogging efforts. 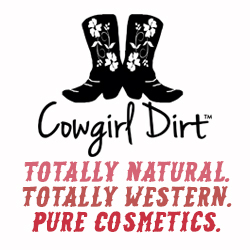 I just put a link in the shop tab above and the links to the right for my daughters affiliate for Cowgirl Dirt – organic mineral makeup. We love it! It’s locally owned and an excellent line of makeup! She would greatly appreciate any and all orders … and referrals!